Got my new universal remote all set up. I was hoping I could just aim my old one at my new one and they'd sync up, but no, the company had to change the way things are done and I had to start from scratch. What that entailed was finding the damn model numbers on my devices, some so small I could barely read them. Stupid old age eyes! But finally I got it all set up and it works great. I always buy the same one over and over as I don't really need anything fancy. My problem is, I keep dropping it on the floor and eventually, it hardly works half the time. Now I've got a brand new one that actually does all the commands correctly. It's amazing how much better it works. So the blizzard has passed. I have 20 inches of snow on the ground. My poor cats can't understand why they no longer can see the birds out back as the snow is blocking their view. I went outside yesterday while it was still snowing and spent an hour and a half digging a path to my car, cleaning off my car and I dig it halfway out. At that point, I was cold, wet and discouraged as two more inches fell on top of what I had just cleaned. I don't use a shovel, I get down on my hands and knees and use a dust pan. It works better for me that way. I don't know how I'm going to get out tomorrow to go to work. I have a very long driveway and the end gets blocked even more by the snowplow. I plan to go out later and clean off my car, dig the rest of it out and clear the road end of the drive. I told my cats if I still had energy that I would try to clear it so they can see the birds again. It's supposed to be full sun and 37F and 41F the next two days so that should help with the melt factor big time. I'm just glad I didn't lose power. Cross your fingers I can get out tomorrow. All right, let's look at two eye looks I've done recently. 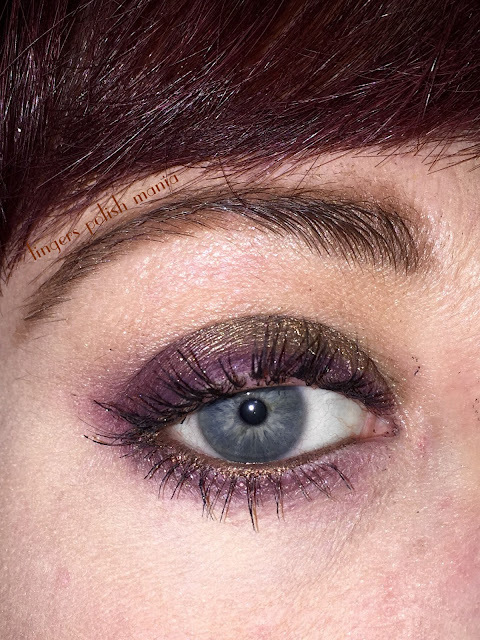 This is Makeup Geek Glamorous, Fortune Teller and Cherry Cola. This is what's called a halo look. Where the darker colors are in the inner and outer corners and the bright bling is in the center. I'm wearing my Ardell Wispies lashes-which are my fave and MAC Gigalash mascara. 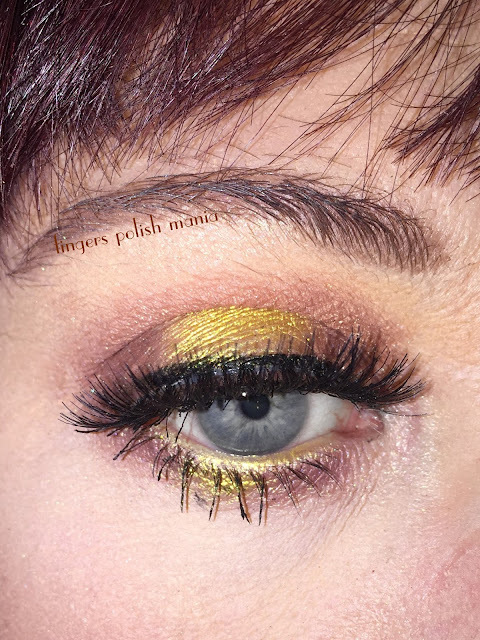 This is Makeup Geek Blaze and Central Perk with Colour Pop Best O and Overboard liners. This is without lashes as it was right before I figured out what I was allergic to. I hope these show up on your computer better than on mine. Since I switched to Windows 10 (which took 5 hours), my color scheme is off and I can't fix it.